...well this was never meant to happen, but it just did. Most fuzz wahs are useless when combined, but as individual effects they sound pretty cool. I think it started cuz i couldn't find the fuzz units alone, etc. So anyway... here's a group shot. Upper line are all the japanese ones. They all give you a glorious "octave up" effect when using the neck pickup on the higher frets! - Companion 8Tr - i believe this is supposed to be the "original" SuperFuzz circuit in this one? Whatever it is, it sounds MASSIVE but still very "tight". - Shin Ei Companion - i think it's the same thing as above, looking slightly different. I've had about a dozen of these and kept these two which sound best to my ears. - Aria Diamond Wah-Fuzz "Built in Sustainer", well whatever that means. This sounds more like a Distortion+ or so, instead of fuzz, not as "hairy". next 3 are basically the same (Aria Diamond, Ibanez, no brand), so i plan on selling 2 of 'em. 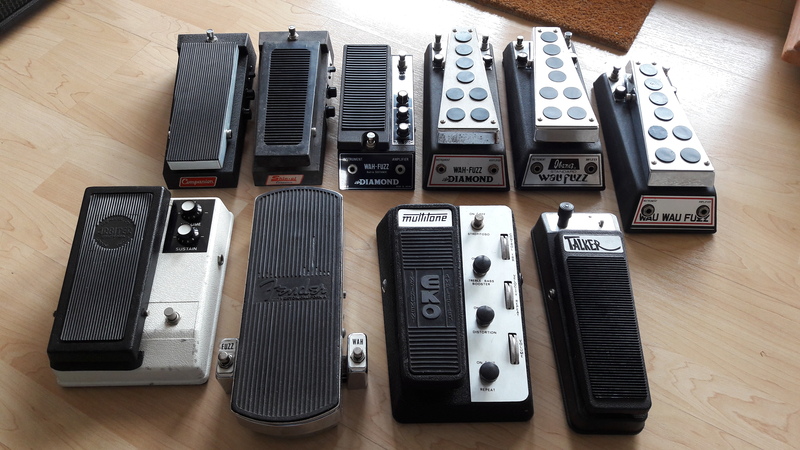 the unbranded one was owned and used by Nikki Sudden, and has the "reversed" wah function than what's standard. another of these (not sure which one) has a defective wah (massive volume drop), so i'll be selling this one in case s/o wants to just use it as fuzz pedal (or repair it). in the end i did get ending up getting a ("standalone") Ibanez Standard Fuzz pedal (other thread). - late 70s Arbiter/CBS ("a Gary Hurst design") Fuzz Wah Swell, UK i guess? Gary Hurst was the guy who designed the original Tone Bender fuzz, and his stuff is pretty collectable. The white "shell" and teadle are actually made of plastic (!!! ), but the sound is massive! - 60s or 70s Fender Fuzz Wah, USA. Gosh this is an unpractical pedal, but i had to have/try one. i keep it near my bed, in case someone tries to rob me - throw this piece of solid metal and it WILL kill you! the sound is rather unspectacular. A look inside is quite interesting, it's all actual little ropes in there! Remember you can use it up and down and sideways, too! - EKO MultiTone, Italy. Well, the world's 1st multi-effects pedal? Could be! It has fuzz, wah, repeater and treble/bass boost all in one. I call it "Spacemen 3 in a box"! OF COURSE all these pedals only make sense with the fuzz turned all the way up - why did they even bother to put a control on em?! Well let's see, what else do we have laying around here...? I've been wanting one of those Ibanez Fuzz-Wahs for years, but first I never got around to getting one, then their prices seemed to skyrocket overnight (which I guess had something to do with a certain band and their use of the Standard Fuzz) and lately I've mostly been selling instead of buying so maybe it's just not in the cards for me. 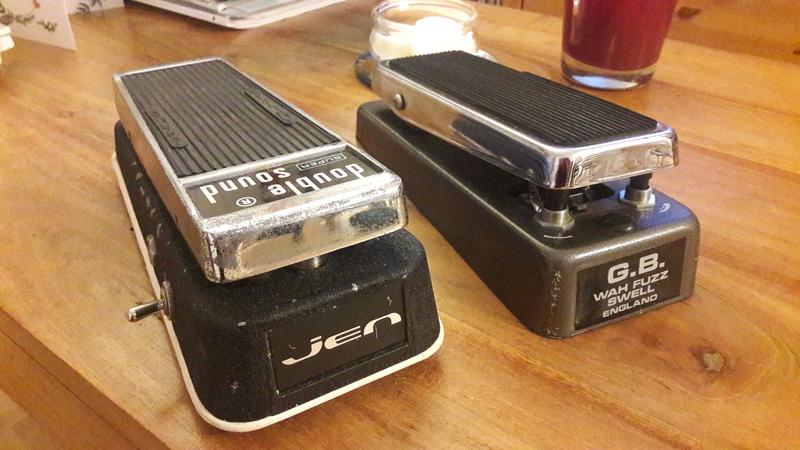 Anyway, the wah side on the one I had was pretty useless but the fuzz side was brutal, a lot like the Fender Blender. Ahh, damn you... And for an extremely reasonable price as well, but I think I'm a bit od'd on pedals at the moment. That b&b neck, though!